Promised place for lovers of the hardest, the metal offers. 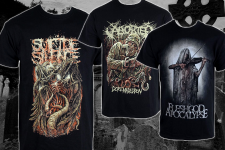 You belong among fans of bands like Suicide Silence, Aborted and Fleshgod Apocalypse? Then do not hesitate and come with us to the favorable package of three shirts bestial extreme bands that we now offer a 10% discount!